Eventide announces a new studio-quality microphone pre amp with 48V phantom power plus effects loop in a compact stompbox form factor. The Mixing Link fits neatly on a pedal board or in a backpack, making the wide world of guitar stompbox effects available to vocalists. 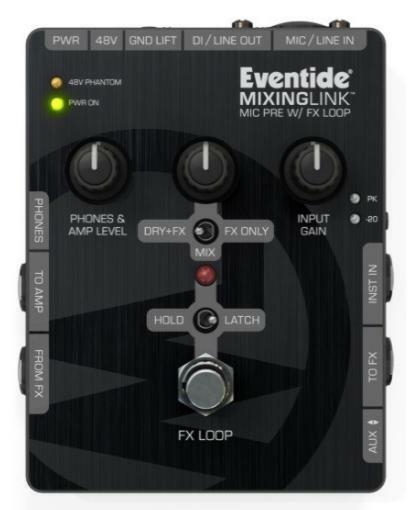 The Mixing Link is scheduled for shipping in December 2013. It works with a wide range of microphones including condenser and ribbon microphones with up to 65dB of clean gain. The effects send/return accommodates balanced and unbalanced signals and interfaces with consoles or guitar pedals easily. An FX footswitch provides a latching or momentary footswitch control of effects loop for performance effects. The Aux I/O-connection supports stereo input and mobile device send level. Further features include guitar amp output and headphone monitor output with separate master volume control, supply by 9V battery or (included) international universal 9VDC power supply, 48V phantom power for condenser microphones, balanced XLR output which supports DI and Line levels (-10dB to +18dBu), instrument and balanced line level inputs (-10dB to +18dBu). The versatile mix control supports 3 modes of operation comprising '100% microphone plus effects', 'microphone/effects balance (effects mix)' and '100% FX (no microphone)'.